The Ramen Shop easily outshines the other Newtown establishments in the looks department. Steamed pork buns with mulled sake. For a cheap eat, check out $12 Shoyu Shiitake Ramen on Saturdays. If the highly-successful British designer Matthew Williamson decided to ditch his career in fashion, move to Wellington, and begin doing pared-back interior design, the result would be quite similar to The Ramen Shop. With sparks of fluoro colour lining the chairs, a flying pig against the wall and a clean minimalist look on all other accounts, the shop easily outshines the other Newtown establishments in the looks department. 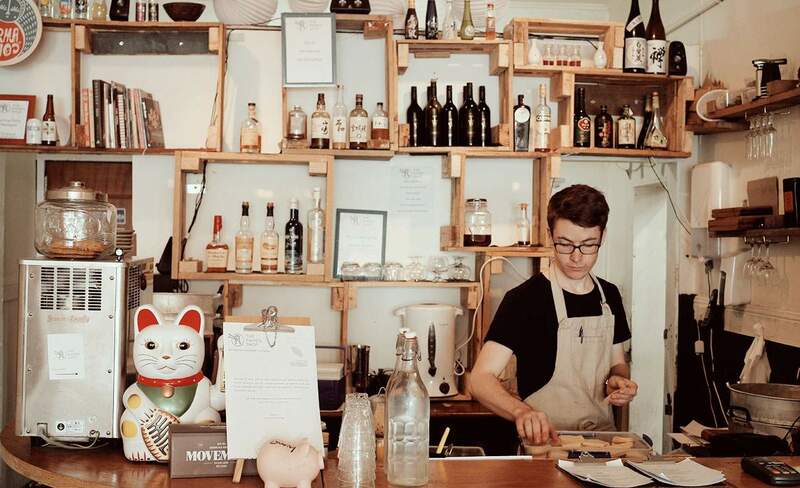 Ramen noodles are traditionally served as a Japanese street food, but founders Asher Boote and Tsubasa Takahashi were looking making the meal more accessible to Kiwis, essentially tapping into our cafe culture to create "a ramen joint with a Kiwi twist". We sauntered over to the laid-back shop on a Wednesday afternoon, ordering a mulled sake ($8), the vego bowl ($12) and the steamed pork buns ($8). The buns were a clear winner, my friend still salivating after them hours after lunch, but the bowl I found a bit on the plain side for $12. Overall, The Ramen Shop is an experience every Newtown local should have at least once - if only to enjoy the pork buns, the relaxed atmosphere and the decor.